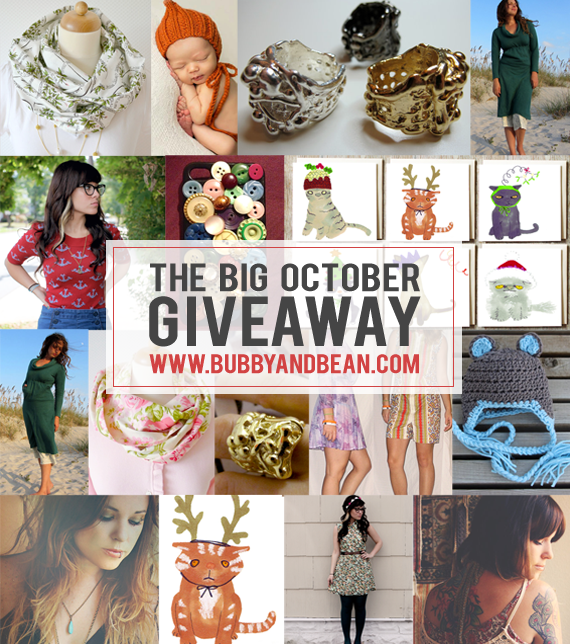 Bubby and Bean ::: Living Creatively: BIG OCTOBER GIVEAWAY // Win A $430 Handmade Prize Package! BIG OCTOBER GIVEAWAY // Win A $430 Handmade Prize Package! Happy Friday! It's time for Bubby and Bean's big monthly giveaway, chock full of goodies from some of my favorite handmade and independent businesses and blogs. This month's giveaway is officially our biggest to date! I've teamed up with nine of October's sponsors to put together an incredible prize package that includes clothing, accessories, jewelry, greeting cards, blog ad space, and more. 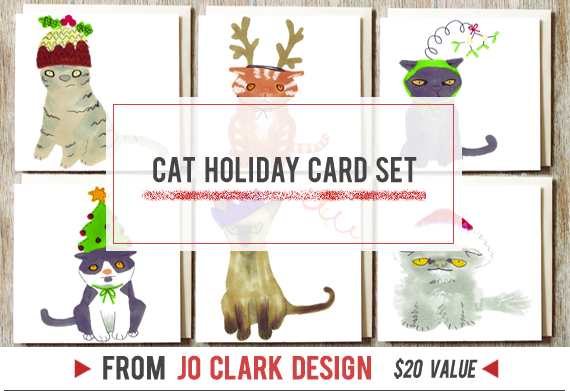 All together, it's valued at $430 - and one lucky Bubby and Bean reader is going win it all! This giveaway is open to Bubby and Bean followers/subscribers. If you're a new reader, please make sure to subscribe first through GFC or Bloglovin' in order for your entry to count. Then just leave a comment telling me your favorite fall color. That's it! Visit any of the shops from this giveaway (Peridot by Duni // Jo Clark Designs // She Makes Hats // Private Opening // Gaia Conceptions // Roots & Feathers // Little Tree Vintage // Made By Miche // Brave Felicity) and list your favorite item(s). Follow us on Instagram (user name: @bubbyandbean). Click the Facebook Like button below to like this post on Facebook. This giveaway runs through October 31st and is open to Bubby and Bean subscribers worldwide. The winner's name will be chosen randomly and announced shortly after. Please make sure that you check back and/or that there is a way to contact you through your entries in case you are the winner. Thanks again to our October sponsors for contributing such incredible prizes! Good luck! 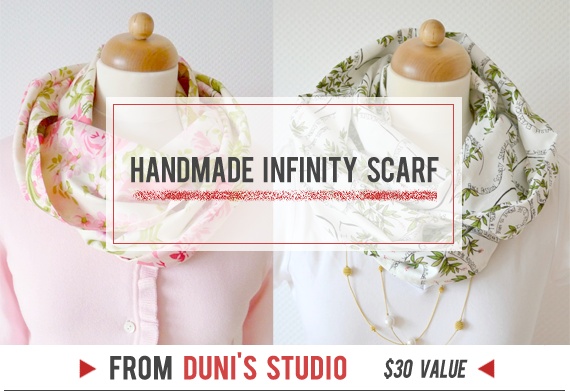 PeriDotbyDuni: Romantic Floral Infinity Scarf ! Jo Clark Design: Hello Mole Art Print ! 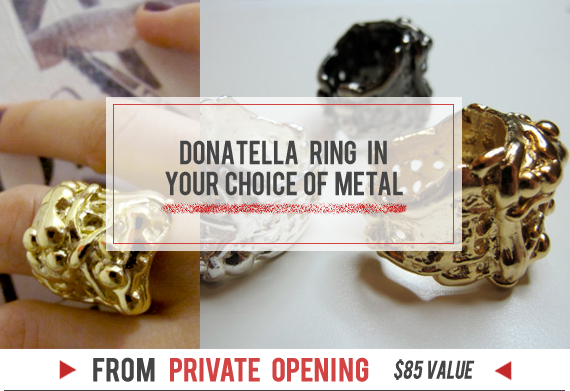 PrivateOpening: Beautiful Sterling Silver ! Gaia Conceptions: Love me 2 Times Perfect Pockets Mini Dress ! RootsandFeathers: Mercedes. a beaded brass arrow necklace in olive and rust ! 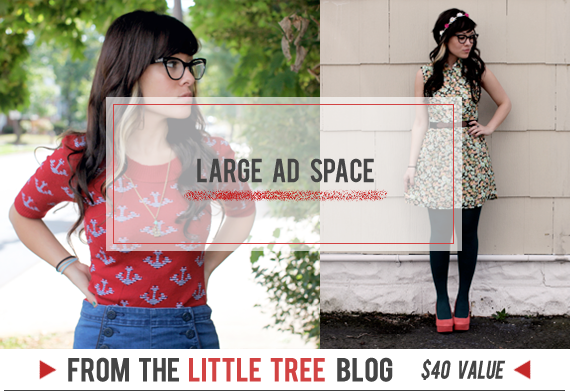 LittleTreeVintage: Midnight Floral Button Up ! MadeByMiche: Vintage Button iPhone Case ! BraveFelicity: Garden Party Scarf Dress ! Mustard yellow is my favorite color! Following Roots and Feathers on Bloglovin! Another great giveaway this month! My favorite fall color is the red in the gorgeous trees this time of year! I want 10 of those trees planted in my yard! My favorite fall color is berry. I love pink, and this is sort of a fall-version of it. I love the "Nostalgic Ruffle Zippered Pouch" by PeriDotbyDuni! Favorite fall color is purple! I love deep plum purple and emerald. I like the dainty daisy ring on Private Opening. Favorite fall colour is Red! thanks for the giveaway xo! favorite fall color is mustard! Favorite color is purple! So pretty! I follow buttons and birdcages! My favorite fall color is the warm red of the tree leaves. I follow via Bloglovin', thank you!!! I like Bubby and Bean on FB. om. a statement crystal buddha necklace. I am obsessed with Oxblood for a Fall color! I follow on gfc as dorcontest and on bloglovin as Doreen lamoureux. My favorite fall colour is deep red. She Makes Hats: Monster Hat!!! Private Opening Fav - Ophelia Open Vine Sterling Cuff! 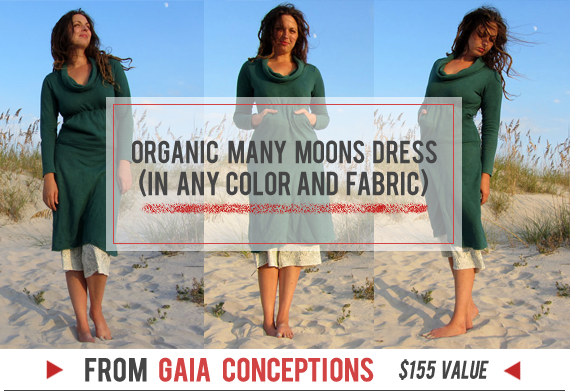 Gaia Conceptions - long heirloom dress! Roots and Feathers fav? Om.a statement crystal Buddha necklace. Little Tree Village: Triangle Quartz earrings. Made by Mitch: button iPhone case. Brave Felicity: Vintage purple dress! I love a good emerald green or purple! My favorite fall color is burnt orange. I follow on Bloglovin'! I went and looked at She Makes Hats. I think I like the babies the best - they are adorable little models! 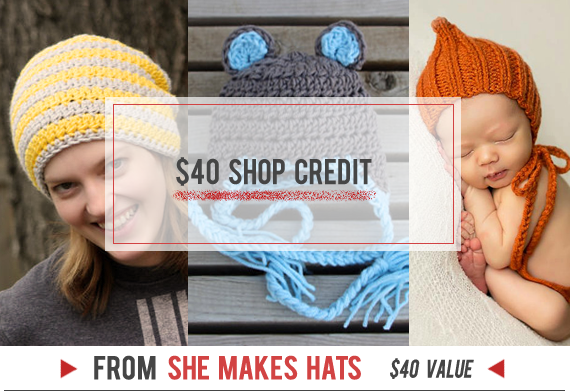 I also like the baby bear hat (https://www.etsy.com/listing/112336457/newborn-baby-bear-hat-greybeard-and-soft?ref=shop_home_active) and the two striped toddler hat (https://www.etsy.com/listing/162910917/2-6-years-two-stripe-toddler-hat-pink?ref=shop_home_active). My favorite fall color is the lovely yellow-orange of the trees! Orange! And followed on GFC And Bloglovin! Favorite Fall Color: Definitely the rich mustard yellow! like my tall riding boots! it looks so soft too. My favorite fall color is red! My favourite fall colour would have to be a wine or burgundy colour. It's so rich and deep. It's also such a great transitional colour from the bright reds, oranges and pinks from the summer. This print is so simply gorgeous! It'd be so warm for the cooler days! my favorite fall color to wear is eggplant, but my favorite fall 'color' is the color of the leaves! :) thanks for the great giveaway! My favorite fall color is probably red... BUT I love it paired with a good chocolate brown, and a hint of orange, and and and... Yeah, I just love fall. All the colors, all the food, all of everything! i like b&b on facebook-beth carbone! My favourite fall colour is orange! I Like Bubby & Bean on Facebook! I like this post on Facebook! My favorite item from "She Makes Hats" is the Sandoval Fundraiser Jane Hat. Not only because pink is my favorite color, but also because some of the profits are going towards helping a family! Win-win! I am loving Little Tree Vintage, specially the Vintage Beaded Purse! The Kyali earrings from Roots And Feathers are just beautiful! In love with the Sweet Rose Bouquet pajama pants from Peridot by Duni. What a cute shop! 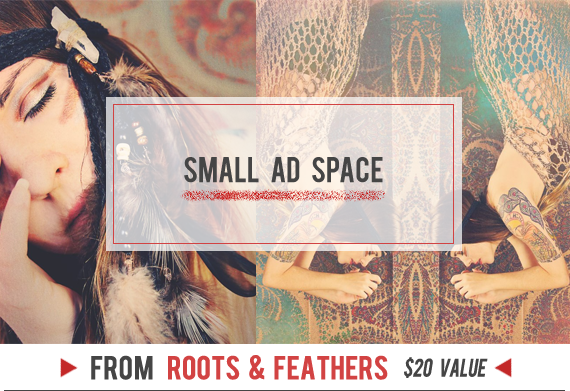 I love Roots and Feathers! Absolutely amazing stuff. My fave item is def the skylar beaded bird necklace. I follow via GFC. My favorite fall color is pumpkin. Roots and Feathers: zara. a pair of black wooden leaf earrings. I like B&B on FB as Suzanne Gregg. Follow in Instagram as kiddomerriweather. Hit the FB like button as Suzanne Gregg. My favorite fall color is purple! I'm following you via GFC. I love the sort of rusty red that's so prevalent right now in our part of Massachusetts. Russet. The pajama sets at Peridot By Duni are great! Oops! Forgot to tell you that my fav fall color is Burnt Orange. Fron Jo Clark Designs I love the Budgies Stretched Canvas Artwork. I have subscribed to She Makes Hats. I love the burnt orange fall color! My favorite color is pumpkin! I'm loving the adele a bird totem necklace with suede fringe from Roots and Feathers! My favorite fall color is definitely orange.